Want to see where we’re at in the end times? Download our High Rez chart and see for yourself! Print it out, share it with friends. Keep a copy in your Bible with you all times! Greetings Brother Christ, Just finished watching your movie, “LEAP: Rise of The Beast”. When I started watching, I didn’t know this was an, SDA movie. And when watching, I heard them telling about the Sabbath, I thought,”Hey, someone has it right!” And when it stopped and I read, “Continued”, I started looking for part 2. But, No part 2 was to be seen. My heart broke, and I went back to the last part of the movie, and saw your web site. And here I am… I want to help as much as I can, which isn’t much. I’m 74 and handicapped. My husband who is in his 70’s also, is still working so we can live in our home and have food to eat and to pay our bills. But we will help as we can. 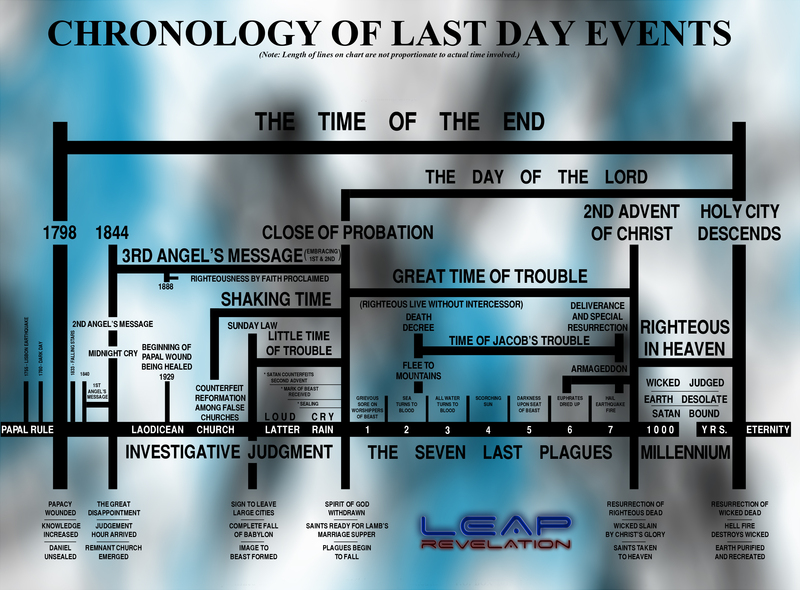 I pray other SDA’s will see this movie and come to your web site, and do the same, so you can finish, LEAP: Revelation… This needs to be finished and pray our Father and the Holy Spirit will draw people to it, and come to reading and studying their Bibles. we will be praying for this work to reach others. May God continue to bless you in your devotion to this film being finished. I’d like to ask you, have you read the little book, called, “National Sunday Law”? Written by, Pastor Jan Marcussen. He is the Pastor who brought me into being an, SDA, back in 1982. If you would like to read his book, you can go to, http://www.WBNS.US, http://www.Reg6.com, or http://www.Jansnewsletter.com. You won’t be sorry if you go and look at his sites, and read his book or read one of his Newsletters. Thank you so much for checking out Rise of the Beast. It actually is the second film, there is one before called “Leap” which follows how Shane became a Christian. It was made for nothing and features some of my “transition beliefs” as I was studying scripture for myself and realizing how wrong most of the Christian world is. By the time we did Rise of the Beast, I still wasn’t an SDA. I actually didn’t get baptized until after the movie was shot. If you want to hear my testimony, check out “The Blueprint: Earth’s Final Movie”, I open with a short version. Thank you again for checking out the movie! If you want to follow the progress as we work on Leap: Revelation, check in at starspictures.org from time to time.